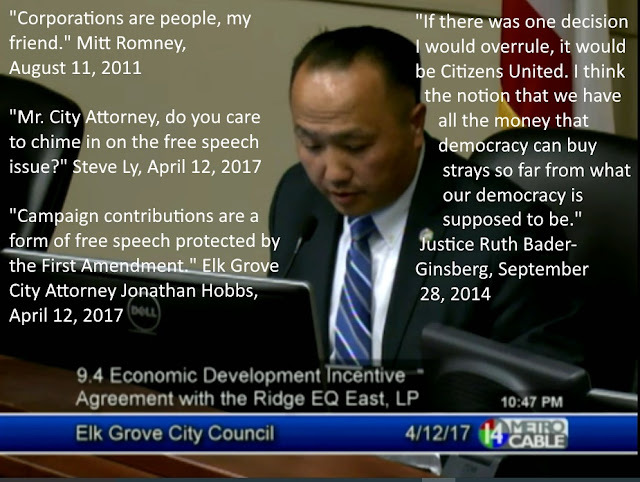 In a major break with his party, Elk Grove Democratic Mayor Steve Ly has tacitly thrown his support for the controversial findings of the 2010 Supreme Court case that has come to be known simply as Citizens United. Ly's defense of Citizens United came during the Wednesday, April 12 city council meeting. That case, which has been widely criticized by the Bernie Sanders' inspired progressive wing of the Democratic Party, even made its way into a State of the Union address when former President Barrack Obama condemned the ruling. The ruling bestowed corporations free speech rights as it relates to campaign contributions. That decision gave inanimate corporations the same rights as people - corporations are people - and with it the rights of Fist Amendment free speech protections. The matter came up when Amar Shergill, Elk Grove resident and executive board member of the Democratic Party representing California's Ninth Assembly District, said the optics of the decision of Ly and his council members colleagues was unflattering. "The politics of this decision are horrible," Shergill said. See video below. Noting that four of the five council members accepted money from Pappas Investments, who then is receiving a $14 million sales tax kickback, Shergill said citizens would question their personal integrity. Shergill went on to say should the city council approve the kickback, which they did, they should return the contributions to Pappas Investments. And for good measure, he added the city council reform how local campaigns are conducted and investigate public financing of campaigns. Ly, who if nothing else in his political career has been a gleeful and prolific fundraiser, was having no part and was visibly annoyed by Shergill. Rather cowboying-up and confronting Shergill's criticism, Ly cowardly hid behind a Citizen United defense and deployed Elk Grove City Attorney Jonathan Hobbs to advocate on his behalf. "Mr. City Attorney, do you care to chime in on the free speech issue," Ly queried Hobbs. Hobbs, using the same rationale as the controversial Citizens United justification that businesses have the same rights as people responded saying "campaign contributions are a form of free speech protected by the First Amendment." "If there was one decision I would overrule, it would be Citizens United. I think the notion that we have all the democracy that money can buy strays so far from what our democracy is supposed to be." Justice Ruth Bader Ginsburg, interview in the New Republic. No Comment to " Mayor Steve Ly Bucks Democratic Party Progressives, Embraces 'Citizens United' Tenets "